» What are your kids watching on YouTube? What are your kids watching on YouTube? Half of children in the UK prefer to watch YouTube than television. Kids enjoy vloggers as a source of content, creativity, inspiration and aspiration. This gives creators a moral obligation not to exploit their impressionable audiences. Children in the UK (aged 5 to 15) now spend around 20 minutes more online, in a typical day, than they do in front of a TV set. According to Ofcom’s annual study of media use and attitudes children spend just over two hours online each day and a little under two hours watching TV. YouTube is becoming the viewing platform of choice, especially with kids aged 8-11. 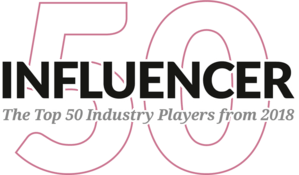 Vloggers are enjoyed as a source of content, creativity, inspiration and aspiration. This is a double-edged sword. Vloggers can offer either a significantly positive or negative impact depending on the subject matter. Almost half of 3-4-year-olds (45%) have watched programmes on YouTube. Whilst 89% of 12-15 year olds have accessed the video sharing platform. However, this year there has been a shift among 8-11s in how they prefer to view content. Forty-nine per cent say they prefer to watch YouTube content rather than TV programmes on a TV set. This is a rise from 40% on 2017 figures. There are both push and pull drivers for the increased time spent watching YouTube over television. Children aged 8-15 feel that linear free-to-air television fails to reflect their experiences, in terms of showing children that look like them, who live where they live and do the sorts of things they and their friends like to do. Children feel pushed from this traditional programming towards the Internet. Hobbies and passions. Lots of children watched videos related to their offline interests – such as tutorials to further their passion for music or football. Some experienced similar pleasure watching others participating in hands-on activities – such as arts and craft, or playing sport – to the extent that they said they no longer took part in these activities themselves in the ‘real world’. Boys in each age group between 5 and 15 are more likely than girls to watch game tutorials/ ‘walk-throughs’ and to watch sports/ football clips or videos on YouTube. Girls aged 12-15 are more likely than boys to watch music videos, vloggers and whole programmes or films on YouTube. 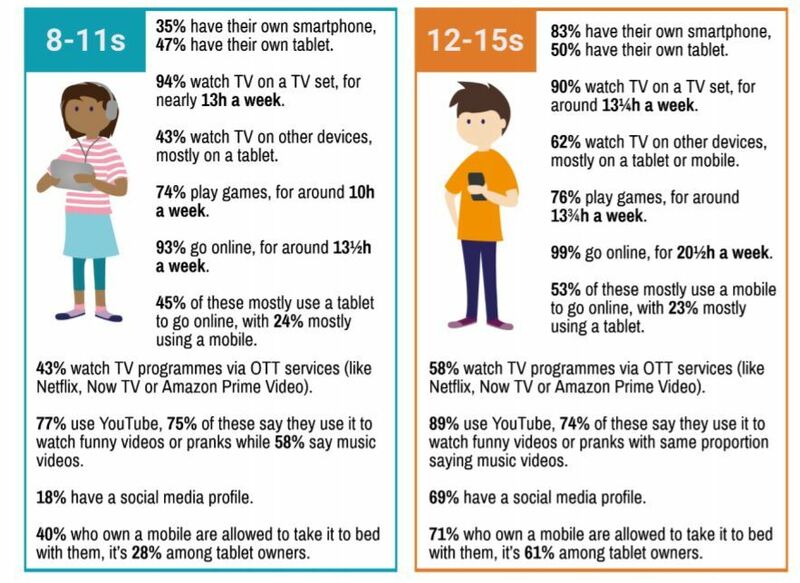 More than two in five children aged 12-15 said they would turn first to YouTube (42%) when looking for information online about how to build, make or create things, with three in ten (30%) opting to use Google. Vloggers and community. 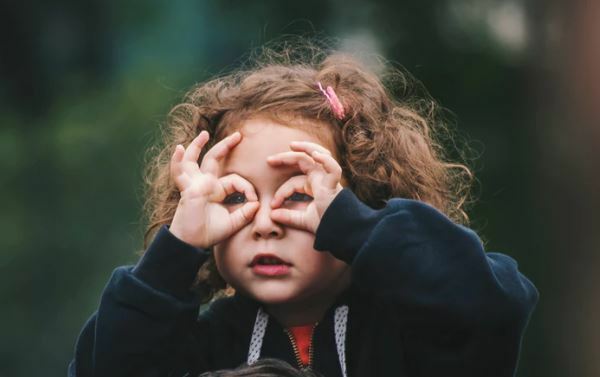 Many children watch ‘vloggers’ or YouTubers, often connecting with them through a shared passion such as sports or crafts, and enjoying becoming part of their ‘follower’ community. Lots of these children said they looked up to their favourite vloggers as role models, or regarded them as a friend who could provide support or advice. This type of content also appealed to children’s natural curiosity about other people’s ‘normal’ lives; they felt the videos had an authenticity which made them easy to relate to. Television was once treated as an unpaid babysitter. Parents would plonk their children in front of the set to be occupied whilst the parent attended to chores. Television stations have to abide by regulations around programming pre and post-watershed. They have to ensure advertisements surrounding children-friendly programmes are child-friendly. By comparison YouTube's safeguards seem far more lax. Many parents of young children do ensure their children can only access YouTube Kids. This app specifically designed for kids, makes it easier for children and parents to find suitable content. 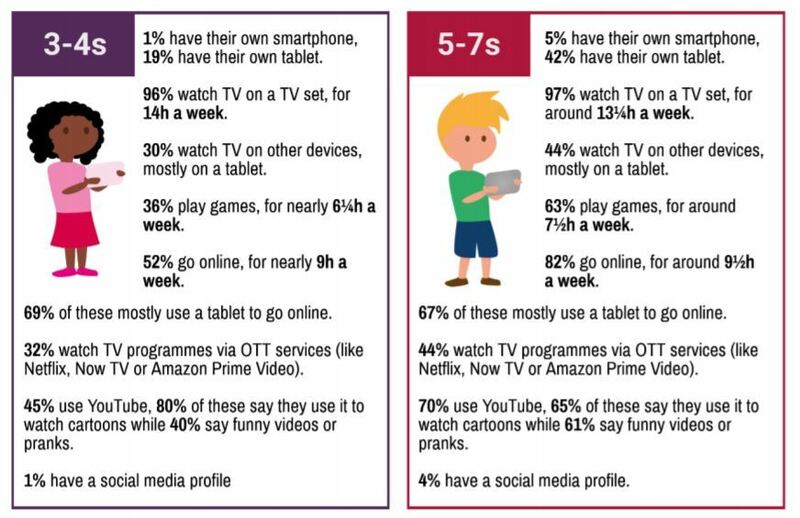 However, the Ofcom statistics show YouTube (i.e non YouTube Kids) is used by close to half of 3-4s (47%) and more than half (60%) of 5-7s who use YouTube. Vloggers are not just an important source of content, they are also a source of inspiration and aspiration. Many of the children in Ofcom’s Media Lives study were inspired by YouTubers and were aspiring to create content like them. In turn these creators have a responsibility to their online community. They have access to relevant data to understand the key demographics of their audience. When that audience is young and impressionable these creators have a duty of care to them. Their audience is not there to be exploited. 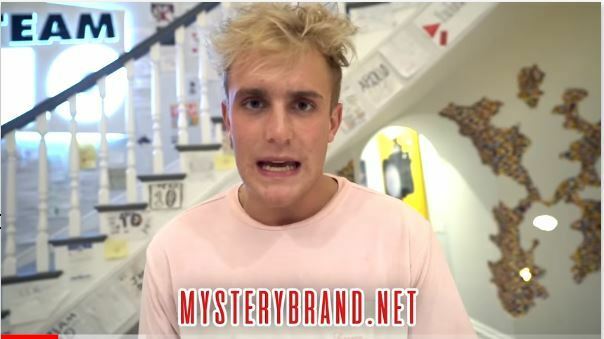 In the article Top YouTubers target kids with online gaming site promo I referenced Jake Paul, RiceGum and Morgz who combined boast 35.8m YouTube subscribers and who all have created paid-for partnership content for MysteryBrand. 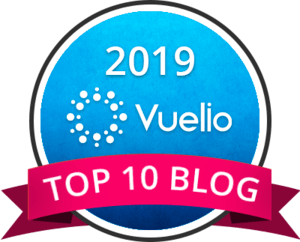 The site is a lottery, come sweepstake, come gambling site. My understanding is that MysteryBrand breaks gambling laws across the United States. As such the influencers are potentially also breaking the law on top of producing ethically questionable content for their young, vulnerable fans. The timing of the paid-for posts is also damning coming a little over a week after Christmas when these children are flush with Christmas money. Promoting gambling sites is not the only 'off' decision made by some YouTubers. Earlier this month Jake Paul took the Bird Box Challenge inspired by the Netflix film of the same name, starring Sandra Bullock. The misguided challenge involves participants taking part in tasks while wearing a blindfold, emulating characters in the film who must evade sight-targeting monsters. Copy-catting this stunt led one Utah teenager to crash her car into oncoming traffic. Earlier this month the unnamed 17-year-old drove on the main road with her woolly hat pulled over her eyes after having seen the challenge on YouTube. The outcome was inevitable. She soon careered into oncoming traffic and hit another car, a light pole and a sound wall. Thankfully, no one was injured in the crash. 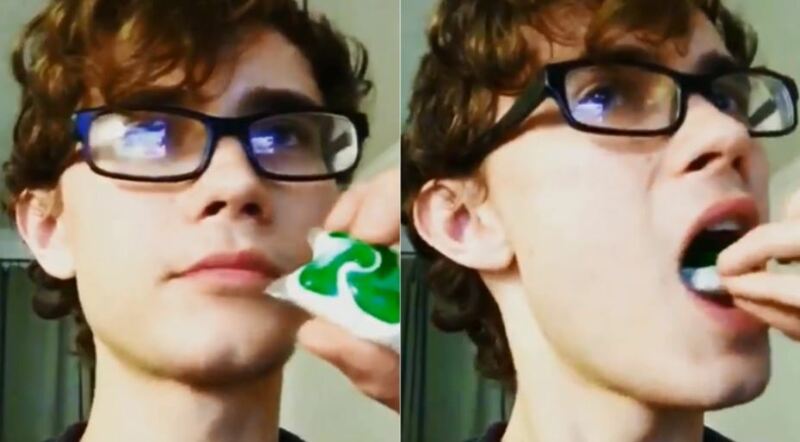 In January 2018 Google took steps to stop the Tide Pod challenge - a craze where participants filmed themselves biting into detergent pods for bragging rights. In 2015 teenagers got caught up in the Kylie Jenner Lip Challenge. Kids attempting to re-create the Kylie Jenner started putting their lips over the airlock created in the opening of bottles to increase blood flow to the lips and causes them to swell. Vloggers are enjoyed as a source of content, creativity, inspiration and aspiration often by young, impressionable audiences. These creators have a duty of care towards these children. They know the demographics of their audience and should not seek to exploit the influence they hold over them.